Although babies do not need a pillow for sleeping (in fact, most books recommend placing them on their mattress without one), colorful pillows can be useful for helping them learn how to sit without wobbling, or to decorate the nursery. 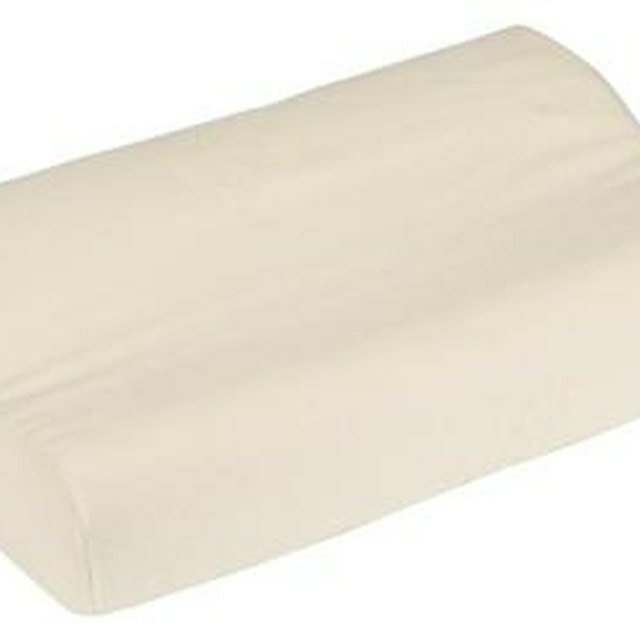 Pillow slips for infants should be hypoallergenic, and should use flame retardant fabric. Choose a flame-retardant fabric that feels smooth when touched and is visually appealing. Bright colors, nursery rhyme themes or other prints make the crib or nursery area attractive and stimulate a baby's developing vision. Measure the pillow. Cut two pieces of fabric 2 inches wider than the dimensions of the pillow and 4 inches longer. Pin the fabric pieces right sides together, matching the edges. Stitch around two long sides and one short side using a running stitch or basic sewing machine stitch, leaving a short end open to insert the pillow. Turn back 2 inches of the short edge (still keeping the pillow slip wrong side out). Press this turned back cuff with an iron heated to the correct temperature for the fabric. Tuck about 1/2 inch of the raw edge under, forming a hem. Press the hem with the iron, and pin in place. Leave the pillow slip wrong side out if you're sewing by hand, and turn it right side out if you're using a sewing machine. Use a running stitch or basic machine stitch to sew the hem in place. North Carolina Product Liability Blog: Flammable Fabrics - Still a Danger?